In the art of cooking, mere moments can serve as the difference between a perfectly prepared dish and an unmitigated culinary disaster. Even the most precise chefs can lose track of the time, especially when they need to create a meal with multiple servings that each require a different cook time, so what does a seasoned chef do when he or she needs to keep precise time on a delicate dish? They employ a kitchen timer, of course. Kitchen timers can take the guesswork out of food prep, and as technology advances, our kitchen timers are gaining more features that make the whole process of cooking a much easier proposition. Since the market is flooded with these types of instruments, we’ve gone and done some of the research that will help you make a decision based on quality and cost. With such a unique and symmetrical name, it’s no wonder that OXO has become one of the preeminent names in housewares. Producing everything between oven mitts and coffee makers, OXO has been at the forefront of kitchenware design since its founding in 1990. Established by Sam Farber whose family was responsible for the Farberware line of housewares, OXO was conceptualized to provide an easier experience for users who suffered with arthritis. Creating a comfortable soft plastic grip that sports the OXO logo (OXO was picked because it can be read from any direction);, Sam’s new company is currently a world leader. The Good Grips Triple Timer as our Gold Pick product has a consumer and critical consensus that attests to its quality construction and excellent feature set. Fronted in stainless steel, this kitchen timer goes well in almost any kitchen décor. At 3.75 inches in height, 2.125 inches in width, and 2.125 inches in depth, this timer is small enough to fit easily in a drawer or cabinet, or sit unassumingly upon of your counter top. The name of this timer belies its triple functionality. Positioned along the upper right side of the device are three rubber comfort grip buttons. The buttons are labeled T1 through T3 and each represents a different timer that you can utilize to prepare dishes. Each timer is capable of timing 100 hours and each will keep time continuously while the other timers are functioning. Have potatoes that come out in an hour, slow-cooking ribs that take 45 minutes, and garlic bread that needs to be in the broiler for three minutes before it’ll turn into a black misshapen hunk of bread? If you utilize the triple timer, all three of these very distinct times will be kept and your food will come out just right. When not timing food, the timer’s LCD screen will display the time, which is a perfect readout in a kitchen where a clock or microwave display aren’t always in eyeshot. OXO utilizes an angular face to ensure that the screen is always readable and four rubberized gripping feet so that there is no unfortunate countertop slippage. On Amazon, out of 284 reviews, 68 percent have given this product a positive rating of either four or five stars. The general consensus on the site states that this timer provides reliable time and features a strong build quality and a highly adaptable aesthetic design. The Iconic KitchenAid design philosophy has existed in American culture since the company’s founding in 1913. In the many generations since the brand’s inception, KitchenAid has stuck with the same high level of quality and reliability that still sees some of its original lines of appliances in use today, almost 100 years after their production. This digital timer is a great example of KitchenAid workmanship that combines beautiful design with sheer lastingness. The first thing that you’ll notice about this timer is the fact that it is comprised of metal. KitchenAid used weighted die cast metal to add a bit of weightiness to this timer. This additional heft, combined with the non-slip rubber base ensures that it won’t move; even when positioned on a wet countertop. Aesthetically, the device sports a cylindrical shape that features chrome accents that make the whole chassis appear very modern. The timing surface, like the surface of our Gold Pick, is angled so that readouts are easy to keep track of. Its cylindrical measurements are four4 inches in height and 7.2 inches in diameter. When it comes to design, this timer features some smart decision making. The large LCD has large numbers so that you’ll be able to see the remaining time on your dish; even in a larger kitchen. This is ideal for when you would like to eyeball the timer and get an idea of how much time you have before you’ll need to add in a crucial component to your dish. The maximum timer allotment is 9:59:59 or almost 10 ten hours of measurable time. Also conducive to a larger kitchen, the alarm for this device is loud and lengthy. In addition to the large LCD display, there are four large face buttons that will let you control the timer’s functionality. The top two control hours and minutes, and the bottom two buttons allow you to pause, stop, start, and reset the timer. The size of these buttons is perfect for those situations where you have hands that are too full to operate smaller controls; you can simply pause or resume with your available elbows. KitchenAid was also good enough to include a memory function that will allow you to select the most recently used time; simply hit the button and the time will display. The timer utilizes two AA batteries that will last you for months, if not years. 79 percent of the reviewing audience on Amazon have felt that this timer is of a high enough quality to illicit a positive four or five star rating. For the most part, users appreciate the larger digits on the screen that allow chefs to keep track of time from further distances and at different angles. Our Bronze Pick has been manufactured by CDN, a company that specializes in time and temperature measurement. 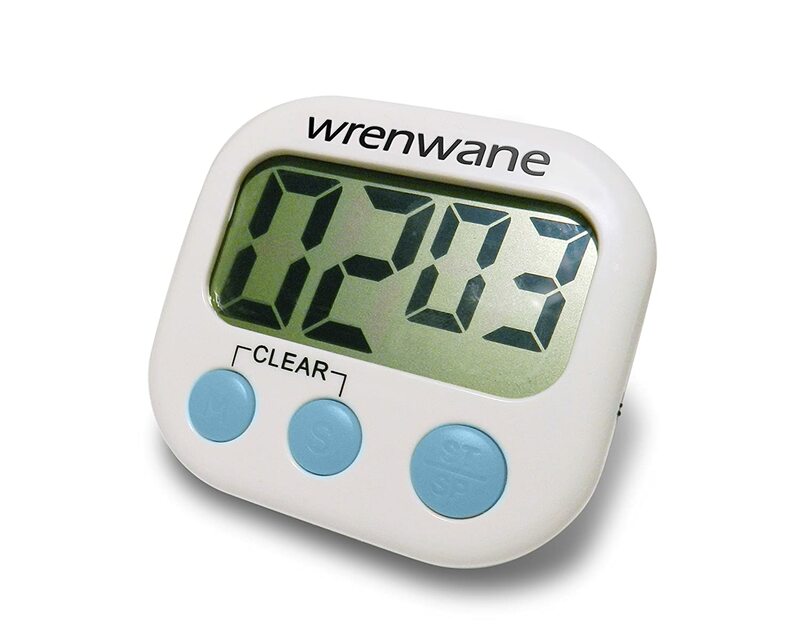 They provide digital and dial thermometers for a variety of uses that have won scores of awards for both design and the practical application of their thermometers and timers;, these include the Housewares Design Awards in 2009 and the nomination of “Best Overall Company” at the prestigious Stevie awards. With such award winning quality, you can expect this company to produce great kitchen products that enhance the food prep experience. To start, this timer eschews aesthetic bells and whistles for smart design. While you won’t be greatly contributing to your kitchen’s décor with this device, you can guarantee that it will be a very functional addition to your food preparation repertoire. Design-wise, the device bears something of a resemblance to a standard calculator; this simple form factor ensures that the user experience will be something that is intuitive and quick. CDN has included a set of mounting holes along the back of the unit, so that you can position this kitchen timer onto a wall. If not directly mounting this item, it works fine directly placed on a counter though, as it utilizes a flat design, it might not be viewable from all angles. 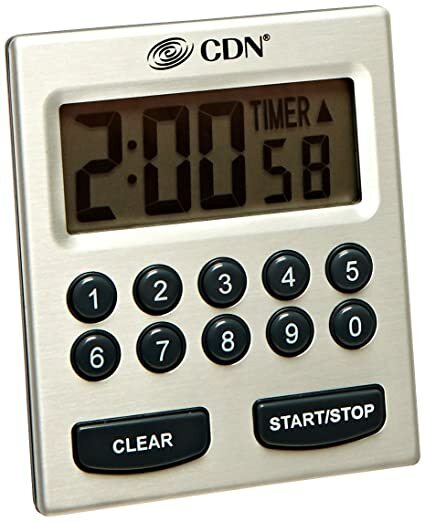 Since keeping time during food preparation is an experience that can vary from dish to dish, CDN was sure to include two types of timer functions into the design of this device. If you want to keep track of how long something is being prepared, simply utilize the count up function. If you have a precise time measurement that you’d like to use that will lead up to a loud alarm, then simply utilize the countdown feature. This versatility will ensure that you are covered when it comes to dishes that need precise timing as well as for those that might require more periodic observation. The LCD itself is large and can measure up to ten hours at a time. Hours, minutes, and seconds are all taken into account on this device and the alarm is loud and also will vibrate when it is active. In case you miss your precise time, the timer will count up the time elapsed since the alarm began to sound, in case you intend to let your dish cook a little while longer than the original timer was set for. 85 percent of the reviewers on Amazon have rewarded this kitchen timer with a rating of at least four stars. 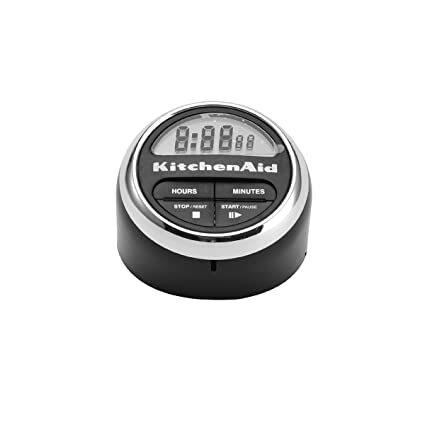 The general consensus is that this nondescript kitchen timer provides a very stable experience and that it can handle a lot of the daily punishment that can happen in a busy kitchen. In general, keeping accurate time during food preparation is not an endeavor that you have to spend a lot of money to accomplish. As a rule, these types of items only cost, at most, around $20 dollars, but what if you need more than one for food prep or are on a budget? Luckily, there is a great kitchen timer that has all of the needed functionality and costs less than $10. Its design is simple;, the whole device is shaped somewhat like a pedometer with rounded edges and a small form factor. The LCD takes up a large part of its overall surface area and features measurements for minutes and seconds only. Beneath the LCD you’ll find a set of minute and second buttons that double as a clear button when pressed simultaneously. Alongside these buttons is a star and stop button that will let you begin or cease timing. When it comes to placement, this timer has a lot of great options. Situated alongside the back of the unit is a large magnet that makes placing this timer on a fridge a very easy proposition. The magnet is strong and will resist your kids’ efforts to knock it off accidentally. Also, if you prefer to have a more grounded experience, there is a deployable stand along the back that will allow this timer to sit at an angle on your countertop. 87 percent of the reviews on Amazon are positive for this kitchen timer. Most reviewers really like the well-designed nature of this instrument and how durable it is when it falls. Dial – This type of kitchen timer is fairly simple and typically doesn’t require a battery to operate. To time your food, simply turn the dial to the appropriate measurement and it will gradually return to zero, at which point it will alarm. LCD – The type of kitchen timer that we’ve featured on our list, this type is a much more technologically advanced device than the dial type. Many of this type of kitchen timer employ additional options for chefs. The drawback to this type is that you’ll have to change the batter from time to time. For the most part, the LCD type has more to offer than the traditional dial type, but the dial type is much easier to manage if you’ll be timing frequently; it requires no batteries and has a fairly easy “set it and forget it” style of design. When deciding on one of these types of devices, take into account your own personal needs and habits and the decision between these two primary types of kitchen time should be relatively easy for you. Spending time in the kitchen while your food cooks is fine but sometimes you might want to go into your living room and watch your favorite show while your cookies bake. If you intend to leave the immediate area of your timer, or if you have a large kitchen, then consider getting a timer with an LCD screen that is angled and has large numbers so that you can see how much time is left from a greater distance. This will save you from constantly returning to the kitchen timer constantly when you are trying to get an idea how much time is left on your dish. As you search for a new unit, be sure that the timer you select has this added visibility;, it’ll save you from having to run back and forth constantly. We put a lot into the décors of our kitchens. While some kitchen timers like our Bronze Pick eschew aesthetics for functionality, sometimes we want a kitchen device to blend well with the overall look and design of our kitchen spaces. Luckily, there are a ton of functional, yet aesthetically pleasing models of kitchen timer on the market today. Many feature different color options, different finishes, and different form factors that can truly make your food preparation space shine. If maintaining your kitchen décor is key to your appliance buying style, then as you search for a kitchen timer, take a look at some of the design options that are available to you for this type of device; your kitchen will thank you. 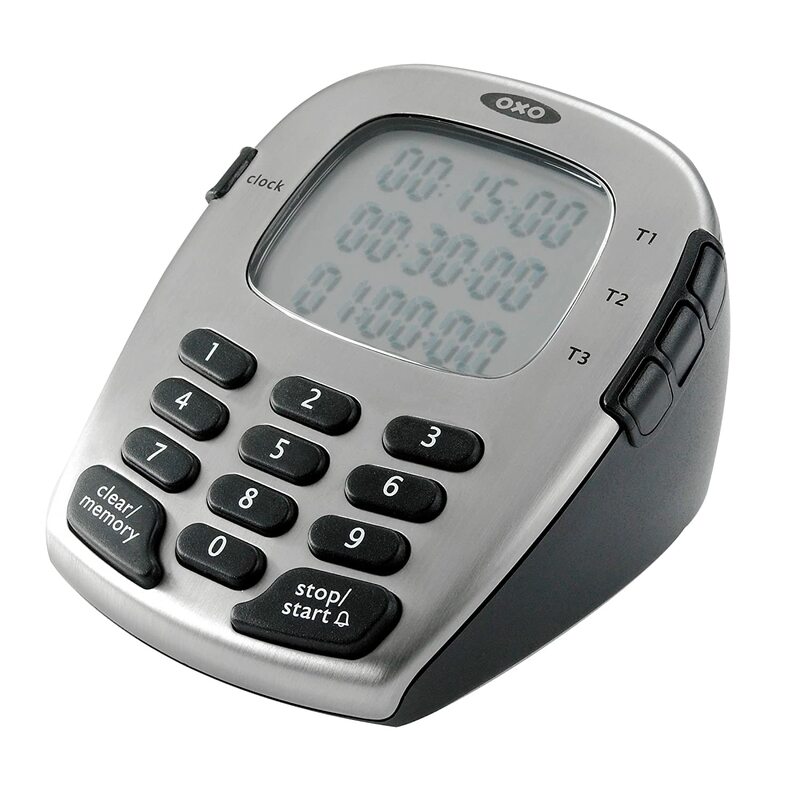 Additional timers – This features allows you to prepare and time multiple dishes concurrently. Simply set one for one dish, set a second timer for another, and so forth. Count up – For those types of meals that you aren’t 100 percent sure of the prep time for, this will help you establish it. Simply start your meal and begin the upward ticking timer. Once the food is ready, you’ll know the prep time, as you’ve been timing it. Time Display – This is handy to have around any kitchen. While many chefs utilize the microwave’s on-board display to get an idea of what time it is, sometimes your microwave isn’t in eyeshot. A timer that has this functionality will tell you what time it is when you’re not timing an item, which is a fairly useful feature to have. Memory – This feature memorizes the previous cook time that you’ve used from your most recent timing session. This is useful if you’ll be needingneed to use similar times for another dish. Keeping time in the kitchen is a key consideration that any cook worth their salt has to take into account. With so many products on the market that are designed to keep this time, finding one that works best for you and your family can be a daunting process. Take a look at our featured products and before buying take a look at our pre-purchase considerations and you’ll have all the tools you need to find the kitchen timer that will make your food preparation an easier prospect.